Our sunlamps are all packaged extremely well with foam on either side and protection over the fragile bulbs and even though the boxes are marked as ‘Fragile’ the shipping companies don’t always handle them with care. If the package was thrown around a lot during the shipping process, the bulbs may have shifted or the filament may have settled. When you receive your sunlamp, if it is not turning on right away, simply follow these few steps to get your lamp working perfectly again. The first thing you’ll want to do is make sure that the cord in the back of the unit is fully inserted into the unit and plugged into a working outlet. Also, make sure the timer is turned on any time you are turning the sunlamp on. Now you will need to check and see if all of the bulbs are fully installed. If any of the bulbs have shifted out of their socket, it can cause the unit to not turn on. To know if a bulb is in the correct position, just check to see if the label on the bulb is facing straight forward. If one or more bulbs has turned, simply grip the bulb and gently twist it back into place – you should feel the bulb ‘lock’ into place. When the labels on all 4 bulbs are pointed straight ahead, then they should all be installed correctly. Once all 4 bulbs fully light up, make sure to continue to turn the unit on and off another 3-4 times to insure that all of the filament is fully cleared. 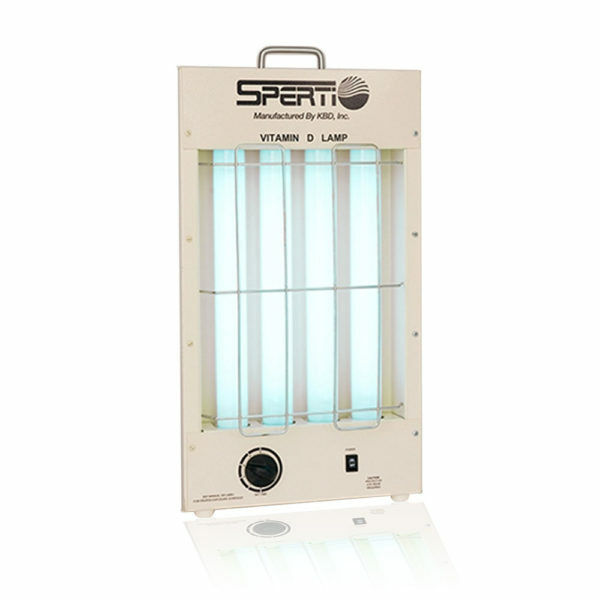 For all Sperti sunlamps, the bulbs have a lifespan of 1,000 usage hours. This means that these bulbs can last your for years and years! It is very important to keep track of how long and how often you use your sunlamp. After the bulbs have been used for 1,000 hours, there is a chemical change which causes them to become less effective. If you do not know how many hours your lamp has been used, there is not really an easy way to test the bulbs. You would need a special machine in order to sample the bulb’s UV output in order to see if it is still in a good, effective range. Since these machines are not easy to come by, the best way to test the effectiveness of your bulbs would be to simply use your sunlamp. After a couple weeks of use, you should be able to tell if you are getting the desired effects or not. 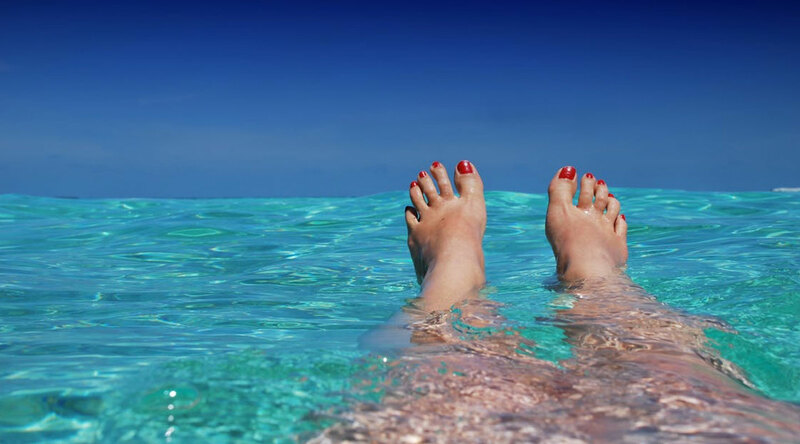 While many people only think about the possible risks of getting too much UV exposure, there are actually many health benefits that come from ultraviolet rays. It is very important to use a UV product that has been cleared with the FDA in order to make sure it is safe and yet still effective for you to use. Most importantly, you must follow the instructions to avoid any irritation of the skin. UVB rays are very important because they help your body produce vitamin D. It is important to have high levels of vitamin D because it can help give you energy, elevating your mood and even lowers your risk for some cancers! Vitamin D has also been found to help in treating or preventing: the flu, depression, autoimmune disease, heart disease, high blood pressure and even diabetes. While there are some risks, like sunburn or nonmelanoma skin cancer, as long as you expose yourself at safe levels, UVB can make a huge difference in your health! A benefit for UVA rays is that they are responsible for tanning your skin. However, there are also more dangers with this type of ultraviolet rays, so it is crucial to only expose yourself in moderation. UVA is responsible for causing melanoma skin cancer and also wrinkles. When using UVA rays to tan your skin, it is important to make sure the light has a good balance of UVA/UVB in order to give you the least risk. A lamp that has more than 85% UVA gives you a higher change of experiencing a negative side effect after long periods of exposure. Our Fiji Sun Tanning Lamp uses fluorescent bulbs that give off about 75% UVA and 25% UVB – this means that it may take a week or more to get the desired tan, but it is much safer for your skin. Overall, UV exposure is essential for living a happy and healthy life. Just make sure to closely follow the directions when using an ultraviolet sunlamp and always wear your protective eyewear. You may have noticed the testimonials listed on our product pages – every one of these testimonials is from a real life customer that simply loves our product. We also have a page on TrustPilot.com that has even more reviews that our customers have shared. We pride ourselves on manufacturing excellent products as well as having the best customer service around. It is important to share your opinions with other perspective buyers because there are other, not as safe options out there and it can be very difficult to make sure you pick the best sunlamp. Every testimonial shared can help someone make the decision that can greatly improve their life. If you are interested in sharing your feedback with us and other sunlamp users, please contact our office so we can tell you how. When you place your order on Sperti.com you will receive a confirmation email letting you know that your order is in the ‘Processing’ stage. This email will also be useful for you to verify all of the shipping information that was entered at checkout – if you notice any discrepancies in the order information, or if you need to make any changes, please call our office immediately. Your order will then be added to our list of products to ship out from our warehouse facility. Orders are shipped no later than 10AM Pacific Time each day. After those orders are submitted, any new orders will ship out on the next business day. Once your order has shipped, you will receive an email with the tracking number for your package and your order will be marked as ‘Completed’. Millions of people around the world are deficient in vitamin D. The most effective way to boost your vitamin D is by getting natural exposure to UV. The sun is the perfect source of UV and just a few minutes outside every day can help raise your levels rather quickly. However, not everyone can get outside everyday due to weather and our busy schedules. There are a couple different ways to boost your vitamin D levels without using the sun. The Sperti Vitamin D Light Box gives you safe and effective amounts of UV exposure directly from the comfort of your own home. With just 5 minutes in front of the light, every other day, you can raise your vitamin D levels in just a couple months. This product is FDA recognized and is proven to help your vitamin D levels raise! For some people, supplements work okay for raising vitamin D levels. However, there are many people that become physically ill from taking oral supplements. You also don’t know exactly how much of the pill your body is actually absorbing because every person metabolizes things differently. With supplements, it is either hit or miss and it can take a very long time to get the desired benefits. Is it better to boost your vitamin D levels naturally through the skin by getting safe amounts of UV exposure or by ingesting oral supplements that your body may or may not absorb? The choice is yours. 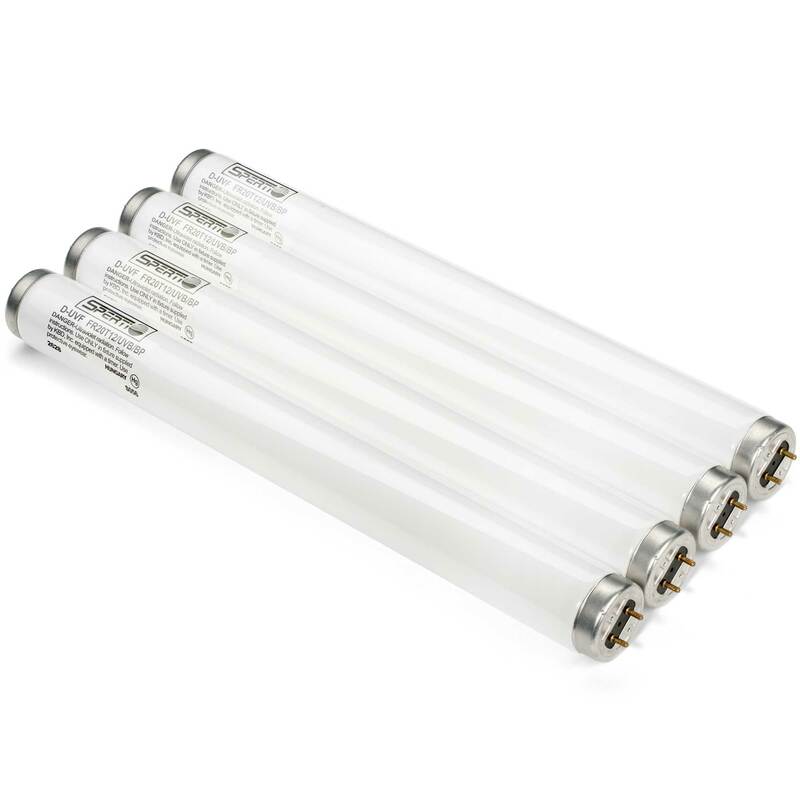 Our sunlamps now come with a 7 Year Warranty! This means that during the first 7 years of your new sunlamp’s life, if anything were to need repairing, we will get it fixed with no additional repair fees! If you ever think your lamp is in need of a repair, simply give our office a call and we will be able to talk you through some trouble shooting in order to make sure that a repair is necessary. If it is, we will send you a copy of our repair form and you just send the unit to our repair center so that one of our technicians can take a look at it in order to get it back to working properly – you just pay for shipping! One thing that is not covered under the full 7 warranty is the bulbs. The bulbs come with a 6 Month Warranty and have a lifespan of 1,000 usage hours. All product warranties are valid for the original purchaser. If you were to purchase a sunlamp from someone other than Sperti or one of our distributors, that product would not come with a manufacturer’s warranty. In the case that a repair is needed on a product that is no longer warrantied, there is a $40 per hour repair processing fee. When being exposed to any UV light, there is always the chance of side effects – this is why it is extremely important to follow the directions very carefully. It is best to start out slowly when first using a sun lamp so that you can keep your eye out for any changes in your skin. It is recommended to check your body for unusual coloring or markings that may appear after UV exposure. You always want to keep an eye out for redness, dryness, rashes or red/brown spots that may appear from over exposure to ultra violet rays. If you notice any skin irritation, it is recommended to stop using the light for a few days in order to give your skin a chance to heal. If you ever notice any unusual markings on your body that do not get smaller after a few days, it is always a good idea to see a doctor – it’s better to be safe than sorry. With all that being said, our sun lamps are very safe for at home use. Due to the balance of UV output, it is extremely unlikely to get any serious reactions from our sun lamps. Simply, make sure to follow the directions in order to build a routine and always wear your protective eyewear – then you are good to go! When you first get your sunlamp, we know how exciting it can be – all you want to do is open it up and start using it. However, there is a very important first step that can not be passed over: Read the instructions! Many people believe that these units are self explanatory because they only have 1 button, but since these are UV lights, it is a lot more complex than you may think. Each unit comes with it’s own specific instructions for how to get things started. Depending on the model you’ve chosen, there will be different times and distances that must be followed. In the beginning of the instruction booklet, you will learn about the different types of skin and how those differences can effect your usage of the lamp. Not everyone uses these sunlamps the same, so it is important to follow the instructions and ease your way into it. The absolute most important thing to remember before using your lamp is: PUT ON YOUR PROTECTIVE EYEWEAR! These lights emit UV rays that could be harmful to the eyes if you are not wearing protection. The goggles that are provided with the unit will give you the UV protection needed to make sure it is safe to use. 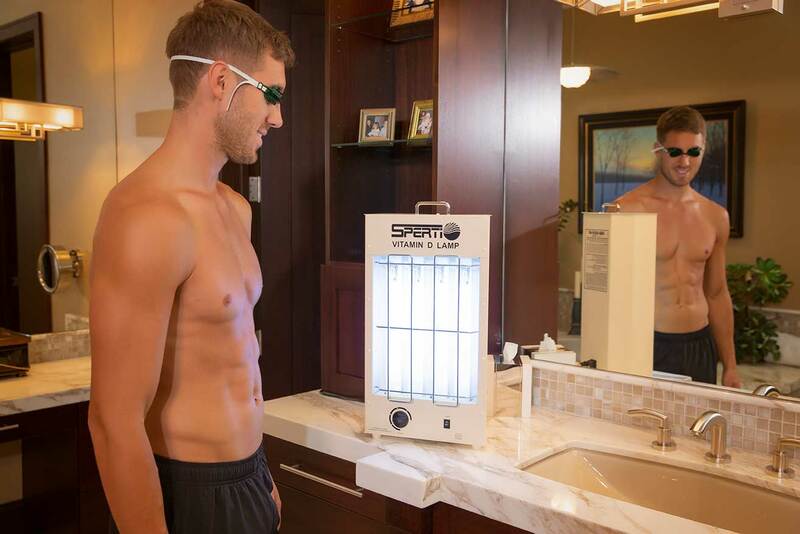 The Sperti Psoriasis Sunlamp uses special UVB bulbs to help treat psoriasis on the skin. Because this is an FDA approved light, it is required that we obtain a copy of a prescription from a doctor before we can ship any unit. If you are looking to purchase the Psoriasis Sunlamp, please make sure you have or will be able to get a prescription for this light. Once you have your prescription, you can either fax it to: 775-622-8060 or scan and email it to: orders@sperti.com Once we receive it, we can get your lamp shipped right away. Because psoriasis effects every person differently (severity, location, etc.) your doctor will need to give you specific instructions for how they want you to use the lamp. When you purchase the Psoriasis Sunlamp, it will come with an instruction sheet that gives general instructions on usage, safety, output, etc. but your doctor will let you know exactly how long to use the light, how often, how close to be to it, and where to direct the light.